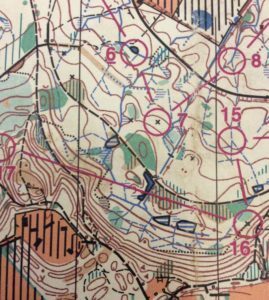 As part of their forest league Quantock Orienteers organise a series of six local events across their region. This year they were nearly all in the Quantock hills to the west of Taunton and the M5 corridor. These locations tend to be beyond our regular reach (hence the almost complete absence of WSX members) however occasionally, as was the case in 2015/2016 and again next year in 2017/2018, some of these QOFL events take place in the Blackdown Hills; a range of greensand hills that straddle the border of Somerset and East Devon. Most will be familiar with the Blackdown hills as that attractive, wooded stretch of the A303 where the single line of traffic tends to grind to a halt as its makes its tortuous way towards Exeter and the southwest. The QOFL events are very friendly, offering an almost full range of courses (except brown). 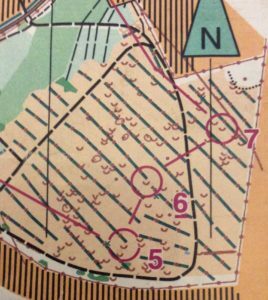 The courses can be quite technical with intricate contour systems and have numerous hidden cairns to seek out. Here follows a summary of some of the locations in the Blackdown Hills that Lyra and I have enjoyed and would recommend to members. Castle Neroche is the site of a former Norman motte-and-bailey castle, built on the ramparts of an Iron Age hill fort; all of which has been covered in secondary woodland. Reaching a height of 260 metres the area is almost exclusively deciduous woodland, dominated by a north-facing wooded escarpment. Several steep sided spurs emanate from the hill fort, like long fingers reaching deep (>100 m drop) down the wooded slopes that are dissected by a labyrinth of ditches and bubbling streams; one even has its own waterfall. In May the woodland was decked in a delightful carpet of bluebells, but away from the seasonal flora the limited path network permits more technical navigation between a mixture of riparian and man made features. A lonesome cairn hidden deep within a featureless part of a distant corner of the wood is presumably the unmarked grave of a lost orienteer, or an intent to add value. Either way, these aren’t mountain-top cairns but small piles of stones, not easily seen at a distance. The topography makes for inevitable climbing and with registration located at the top of the hill, this ascent comes at the end, testing the legs and the concentration (as I found to my own cost) but well worth the effort. Further to the west, and rising above the M5, close to the Wellington monument are the twin sites of Culm Davy and Culmstock Beacon. These contrasting sites offer a range of habitats from gorse studded grassland and sandstone escarpment to relatively flat compartments of open woodland and bracken. Culmstock is famed for its Elizabethan beacon built to warn of an invasion from the Spanish Armada. If you have time then the scarp offers long reaching views over Devon, although my eyes were glued to the complex system of re-entrants and form-lines. The passage back from Culmstock and up the bank to Culm Davy passes along a narrow corridor and the house with a barking dog. Safely into Culm Davy the grid network of tree covered earthbanks are evidence of a more ancient field system. For some compartments there are no notable ground features, whilst for others there are a multitude of either pits, or tree stumps, or distinctive trees, which may be linked to each field historically having had a specific use. Again there are more graves of lost orienteers (small cairns) on the south-eastern slopes. We had mixed experiences at Culm Davy. I enjoyed my run but then had to hunt for Lyra who never made it to the finish. With no report of her at the finish, I memorised the yellow course and set off in pursuit of her, without any luck. I found her later at the car having made her way off the map and back to registration. She had got lost at the penultimate control trying to follow an indistinct path. Losing a child in a woodland sends me into panic, but she grew a little older and more mature that day. She vowed never to do a QO yellow again, but that didn’t last long. The third area of the Blackdown Hills, which we visited in October, was Blackborough South. Part of a much larger area, this is again a combination of wooded escarpment and flat woodland, close to Honiton. 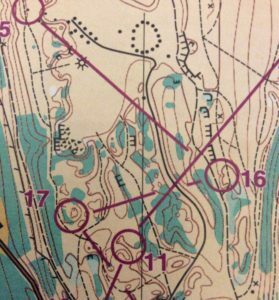 Large parts of the southern end are felled and the map includes an O-symbol I hadn’t encountered before – “line of debris”. These are depicted as dark green lines interspersed regularly with brown dots – think earthbank but with green connectors. These tend to run parallel to each other and represent lines of brash from felled trees. Dotted liberally throughout these deforested areas are a surfeit of small depressions; find your control quickly and you gain time. 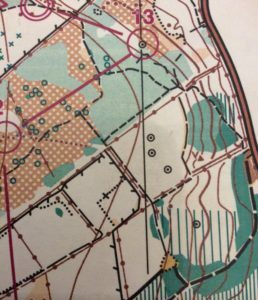 Many orienteers lost track of the debris lines, or veered off on slightly inaccurate compass bearings, and ended up at the wrong depression, leading no doubt to depression itself. The final site is not actually in the Blackdown Hills, but much nearer to home, at Ham Hill near Yeovil. This again is a hill top, and the site of a former and ongoing quarry works. The bedrock is the famous Hamstone – a honey-gold coloured Jurassic limestone that makes all the villages nearby appear golden. There is even a large stone circle on the map. Surrounded on all sides by a steep escarpment the summit of Ham Hill is a warren of re-entrants, dells, pits, small depressions and intricate topology. There is considerable public access, but the series of car parks and radial paths that emanate from them merely adds to the confusion. This is a great place for practising navigation by contours and keeping map contact, but not one to forget your reading glasses on. The map is 1:5000 which further adds to the tendency to over run. It may not be Lakeland complexity but it’s a great area to run around in circles or simply to stand and enjoy the lovely views over Somerset. We certainly enjoyed all of these events and look forward to revisiting Ham Hill, Blackborough and Castle Neroche as part of next year’s QOFL series. I would encourage the trip from the south coast. I’m sure there are plenty of country pubs nestled amongst the Blackdown Hills that could be combined to justify the journey. The final QOFL of this year is at Staple Hill, the highest part of the Blackdown Hills at 315m. It is close to Neroche, and in similar terrain. Orienteering tests us both cerebrally and physically but it also feeds our desire to explore and this corner of Somerset and Devon is definitely worth exploring.